Under normal circumstances the retirement of a 42 year old from first-class cricket, especially one with a Test record of 2350 runs at an average of 27.32 boasting just two centuries, would not warrant the kind of acclaim and the sheer number of eulogies that have been accorded Mark Ravin Ramprakash this week. However, the man from Bushey’s departure from the game does not herald the retirement of some time-served stalwart, some gnarled county pro, but possibly the end of a line, and, as sporting romantics just love, the curtain fall of a great, though unfulfilled, talent. From his early days as a Middlesex under-11 regular,Ramps’ prodigious talent was evident. Certainly, it was that talent that brought him the attention of fellow Londoner Graham Thorpe, then competing across the river with Surrey. Along with Thorpe and fellow future England team mate Nassar Hussain, the three formed the Brat Pack of young English batsmen who, it was hoped, would carry England out of the dimly lit mediocrity of the late eighties and the second round of defections to South Africa at the end of the 1989 domestic season, a summer when England had suffered a comprehensive 4-0 drubbing at the hands of Allan Border’s Australians. Border’s reinvention as Captain Fantastic, aided by the coaching and motivational skills of Bobby Simpson, is one of the great stories of cricket’s last quarter century. Ditching the disappointments of the 1985 English touring squad, Border and Simpson set about identifying young talent and sticking with it. The policy did not reap immediate rewards – and it was understood that it would not – but players like Steve Waugh, Merv Hughes, Geoff Marsh and David Boon benefited from the knowledge that their talent was backed and encouraged. So patient were the Aussie selectors that it was not until the summer of 1989 – another Ashes year – that Waugh’s breakthrough hundred was achieved. It was against this backdrop – the rise of Australia – that first the young Atherton in 1989, then Hussain the following winter in the Caribbean and then Ramps in 1991, would earn promotion to international cricket’s top table. Thorpe, known as strutter would go on to make his debut in 1993. Near exact contemporaries of one another, both Atherton and Hussain were born in 1968 while Thorpe and Ramprakash came into the world the following year. It is one of those oddities of cricketing history that the most lavishly gifted, the most aesthetically pleasing of the four, should go on to have the weakest record at the top level.Much has been written in the past week as to how Ramprakash would have fared under more sympathetic management than that which prevailed over English cricket throughout the nineties. It is not my intention to add to that, save to say that a more understanding chairmanship than that of the occasionally bumptious Illingworth, with his petty, inverted snobbery and crass insensitivity, might have created a more harmonious atmosphere in which a young player might settle into international cricket. Earlier, in 1991, Ramps had been given his chance by Ted Dexter when chairman. However, under both regimes, continuity was hardly the watchword. A system of management initially introduced in the winter of 1986-87 to induce continuity and inclusivity had long since descended into farce by the end of Illingworth’s reign. Flair and originality came to be mistrusted, with the emphasis instead being placed on a kind of yeoman conformity. Witness the jealousy and spite which followed Devon Malcolm around South Africa in 1995-96, a tour in which Peter Lever pointedly asked “where’s the black boy?” during a net practice when the Derbyshire fast bowler could not be located. More famously still, the maltreatment of Gower, perhaps the most innately gifted English post-war batsman was the sign that the days of the dilettante were over. No matter what class he brought to proceedings – hundreds in Melbourne and Sydney in 1990-91,his sense of comfort against Wasim and Waqar during the blitz that was the 1992 summer – it was clear that he no longer fitted. The England set up now belonged to cricket’s equivalent of corporate conformity: business casual with dress down Fridays and a sense of enjoyment which was of the manufactured team building variety. It could be argued, no doubt, that the incumbent regime reflects this to a degree, too. However, under Fletcher and Vaughan and now Flower and Strauss, flair has been harnessed – even encouraged – in a way it never was during the turgid nineties. Moreover, the team’s status as world number one demonstrates that it palpably works. Ramps, the handsome would-be dancer entered international cricket during this stormy period of English cricket when selection policies – if they can be called as such – reflected the loss to the national game of a much loved old guard and the elopement, once again, of yet another disgruntled group of English cricketers to South Africa. What then have we lost with Mark Ramprakash’s retirement, and why do we feel such a sense of loss? Clearly something of a living legend around the London schools circuit by his early teens, Ramprakash perhaps first came to national prominence in the 1988 Nat West final at Lord’s. Coming in at number 6 chasing Worcestershire’s total of 161-9, Ramps took command and demonstrated a poise and maturity beyond his years. But beyond the score of 56 lay something else, something that made English hearts flutter. After a period when England had deployed a succession of bat wafters, fidgets and seemingly mechanised county stonewallers – think Tim Curtis, John Stephenson and Kim Barnett – along came someone, barely 19, who actually looked the part. After his Man of the Match award at Lord’s in September ’88, the 1989 season spelled disaster for England as they were dismissed by a revamped, recalibrated Australia. The subsequent South African rebel defection, made known during that summer’s Old Trafford Test, meant that the English batting cupboard looked bare once more. However, Atherton had debuted during that year’s Trent Bridge Test and, although curiously omitted from that winter’s tour to the West Indies where Hussain made his Test bow, he returned to regularly partner Gooch in 1990, aged just 22. After England’s tour of Australia in 1990-91, Gower’s last as an England player at just 33,Ramprakash was picked for his Test debut against West Indies for the Headingley Test in 1991. He was 21. From the moment he descended the pavillion steps Wisden Cricket Monthly noted, he looked the part. Facing a still formidable Marshall, along with Ambrose, Walsh and Patterson, Ramps famously constructed just about the most technically and aesthetically adroit pair of twenty sevens that it is possible to make. In fact, each innings that summer looked like a cameo of a potentially great innings. Rarely ruffled, he seemed to relish the challenge of the fast men only to receive the impossible ball or lose concentration just as he seemed, as he invariably was, well set. The Ramprakash Test career subsequently brought with it the occasional gem amongst his disappointments and baffling underachievements. Recalled from a poor 1992-93 winter he turned on the class at the final Test of the ’93 home summer against the Australians with 64 in the second innings. A disappointing West Indian tour followed as England were beaten 3-1 by Richardson’s team. In the winter of 1994-95 he received the SOS to join Atherton’s England in Australia. Immediately he performed with 72 and 42 in the Perth Test, the fast even track proved to be to his liking.Furthermore, he seemed undaunted by the most celebrated bowling attack of the day. His 154 in 1998 against the West Indies was his highest Test score and showed judicious shot selection, sumptuous off driving and nimble footwork. There is something undeniably exotic and Ranji like about the follow through as he off drove Carl Hooper’s off spin.His only other hundred, a 133 against Australia at The Oval in 2001 at the end of a series in which he always appeared to threaten a big score, showcased his talent. The bear hug from Darren Gough as he reached three figures showed what his team mates thought of his talent. An interesting anomaly in his Test career is his average of 42.40 in 12 matches against Australia, a period in which they were unquestionably the strongest team in the game. Alas such moments were all too few. His overall Test average was an unhealthy looking 27.32 ,from a total of 2350 runs. In the first class game, he finished with 35659 runs at 53.14 with a high score of 301*. Moreover, his total of 114 hundreds matches that of his great hero Viv Richards. 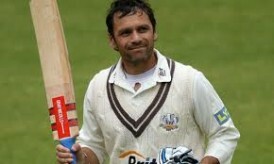 Ramprakash’s last Test came on the New Zealand tour in April 2002 at Auckland. During that tour,Duncan Fletcher noted, Ramps was shot. A comment on his mental state and not on his technical competence. Yet that tour came at the end of a home Ashes summer when he had looked increasingly assured as the series wore on. At 32 Mark Ramprakash’s Test career was over. All the while this convoluted character was compiling mammoth scores for Surrey almost at will. In the county game he had transformed himself into a latter day Hobbs or Boycott. So, what exactly went wrong? There are those judges who saw him at close quarters within the England camp who argue that he simply placed far too much pressure on himself to succeed. Atherton and Ray Illingworth attest to the strain he placed on himself by not being able to relax and simply enjoy what was going on around him. Rarely having a full series in which to relax himself he no doubt felt that each opportunity was the last chance to impress. With one, perhaps two Tests to impose himself, perhaps the pressure to conjure up a score, and a convincing one at that was too great. The pressure he must have felt appeared palpable at times. From personal recollection the 2000 Lord’s Test against West Indies was a case in point. Having been called up to open the innings, he had failed in the first Test with 18 and 0. In the Lord’s Test the first innings saw him dismissed for a duck once more, this time unluckily from a fine delivery by Walsh. In the second innings, and now clearly under pressure for his place and due to the match situation, he was bowled swatting wildly at Walsh for 2. Rarely can a batsman have walked off so apologetically. During that second innings he had lasted 16 balls, the tension building within during each delivery. He had played fresh air forward defensives by the dozen, taken innumerable deep breaths between deliveries and then taken the most injudicious swipe at the Jamaican. It seemed almost an act of mercy to see him dismissed.